Sponsored: Oregon Chai Twitter Party!! Just like my mom, I LOVE tea! It's become part of my morning ritual, just as it was and still is hers. A little cup prepares me for the long day ahead. 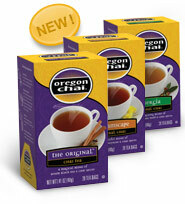 Oregon Chai, one of my favorite brands, is hosting a Twitter Party on Wednesday, August 15, 2012 from 5-6 PT!! This is your chance to win some great prizes including a Kindle Fire, plus the opportunity to chat with other fans. Starting tomorrow, We’re offering one lucky Facebook fan the chance to win a $5,000 Chai-scape makeover for their backyard. As an extra bonus, 1,000 fans who enter will get a chic Oregon Chai Iced Chai Tumbler. Check out the “Chai-scape Your Backyard” Facebook tab tomorrow to learn more: http://www.facebook.com/oregonchai. Plus, let others know you're coming to the party:Tweet: Summer Twitter party alert! Use #OregonChai & follow @OregonChai on 8.15, 5-6 pm PT for a chance to win chai and a Kindle Fire grand prize. One of the many prizes includes these new bags! Disclosure: This is a sponsored post by Oregon Chai.